It's beginning to smell a lot like Christmas... winter holidays would not be the same without the rich fragrances that we've come to associate with the festive period: mulled spice, clementines, gingerbread, pine. 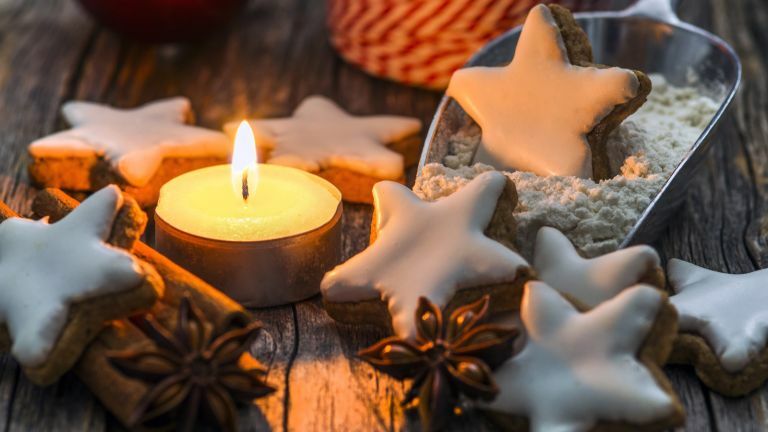 From festive baking to plant arrangements and Christmas candles, we've got lots of ideas for making your home smell unmistakably of Christmas this festive season. And, take the legwork out of your Christmas shopping by checking out the Real Homes team's top 50 Christmas gifts for 2018: we want them (and so will you and your friends and family). If you are a lucky owner of an open fireplace, then surely Christmas is the perfect time to use it? Not only will it keep you warm, but the firewood will fill your house with a relaxing smoky fragrance. Pine and spruce smell amazing even if you aren't using them as firewood; take inspiration from this living room by Debenhams and integrate logs into your winter decor scheme. No place for lots of wood? You can create a similar olfactory experience with pine or cedar incense. There is something unmistakably Christmassy about the smell of a freshly peeled clementine. A bowl of some kind of citrus is a must for the festive season; add some hot chocolate into the mix, and you've got festive perfection. Or – how about an exclusive pick-and-mix tin of Quality Street from John Lewis? It's coming soon to select John Lewis stores... Go on, you know you want to. Take cue from winter cooking herbs and create your own fragrant arrangement. Think rosemary, bay, sage, juniper... then put them in a vase in the middle of a warm room, and be soothed by the powerful, natural fragrance. And if these herbs are all a bit too savoury for you, why not try adding some dried lavender to sweeten things up? Nothing smells as amazing and festive than a real Christmas tree. Worried about the impact on the environment? Look for the British Christmas Tree Growers Association symbol when buying your tree – their growing practices are strictly regulated and respect the wildlife that makes the trees their home. If you have a garden, then buying a potted tree may be a good option, but be sure to look after your live tree, watering it frequently and keeping it away from radiators. After Christmas, replant in a larger pot if you want to reuse next year, or plant in your garden to see if it will take as a permanent feature. Potted trees are available at Wyevale Garden Centres from late November. If you do prefer an artificial Christmas tree, there are Christmas scent reed diffusers that provide a convincing alternative. Our favourite is Albero di Natale by Dr Vranjes, a piny and resinous diffuser fragrance that is the next best thing to a real tree. Just be sure to keep it well away from pets. Eucalyptus is a great wreath-making alternative to pine and fir branches; a pliable and supple plant, it will also fill your home with its distinctive, woody fragrance. Eucalyptus is often available from independent florists and flower markets. Love the look but don't have the time to look for the real thing? The Frosted Eucalyptus Mix Wreath from Cox & Cox looks very realistic and pretty. You can fragrance it with a couple of drops of eucalyptus essential oil, which is available in pharmacies. Unleash your inner domestic god(dess) and put that recipe book to good use; not only will you end up with delicious treats, but also with a beautifully scented kitchen! Mulled wine is one of the easiest festive treats to make – all you need is wine, sugar, clementines, and spices; another easy-to-make option is spiced pear. Again, all you need is sugar, butter, spices, and good cookware. Oh, and a dash of cream to serve. Voilà, a yummy dessert. These spiced pears have been made with cookware from Dunelm. Combine decorations and home fragrance by stuffing hanging cushions with your favourite combination of winter spices. No good with a needle and thread? Get these gorgeous Christmas Spice Hearts and Stars from Jan Constantine. Can't stomach any more mulled wine? There are plenty of non-alcoholic (and highly fragrant) options out there, especially in the herbal tea department. We love the Spiced Winter Red Tea by Teapigs. Perhaps the easiest way to fill your whole house with festive fragrance is by dotting it with scented tea lights. Our pick is the Spiced Orange set of tealights by Beefayre. This UK company donates 3 per cent of their profits to bee conservation and is available at Not On The High Street. Explore a wider selection of Christmas candles in our buyer's guide. There's nothing like the smell of a freshly baked cake, especially around Christmas, when all the spices come out for the mince pies and festive cakes. Make sure that when you're done, you cover everything up to keep it fresh throughout the festive season. The Round Cake Tin from Garden Trading will keep your cake pristine, and is not just for Christmas. Not getting a Christmas tree this year, but yearning for the lovely pine smell? You can still fill your home with the ultimate Christmassy smell – just be sure to shop around for a high-quality fir home scent. The Fir Tree Collection by The White Company hits the mark, and includes a candle, a diffuser, and a spray (handy for an artificial Christmas tree).